Foreign real estate securities led the rally last month, closely followed by US-listed property linked stocks. The only slices of global markets that retreated: foreign high-yield bonds, bonds issued by emerging markets and a broad definition of commodities. For the trailing 1-year period, US stocks and bonds (along with the Global Market Index) continue to post gains, courtesy of this year’s broad-based rebound in markets after the sharp correction in late 2018. The strongest gain last month was posted by S&P Global Ex-US Property Index, which increased 4.6%. US-based real estate investment trusts (REITs) were a strong second-place winner in March via the MSCI REIT Index, which gained 3.3%. Note, too, that US REITs are currently posting the strongest year-to-date gain for the major asset classes with a stellar 16.3% surge. The Global Market Index (GMI) rose 1.3% in March, marking its third straight monthly gain. 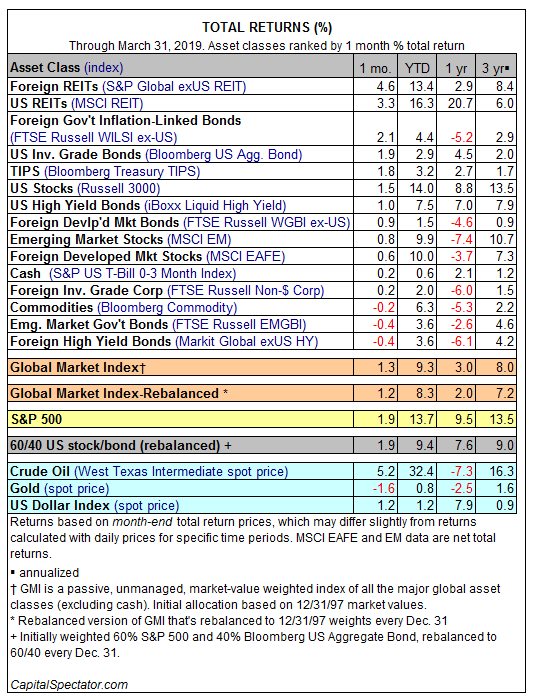 This unmanaged benchmark, which holds all the major asset classes (except cash) in market value weights, is currently up a solid 9.3% year to date. 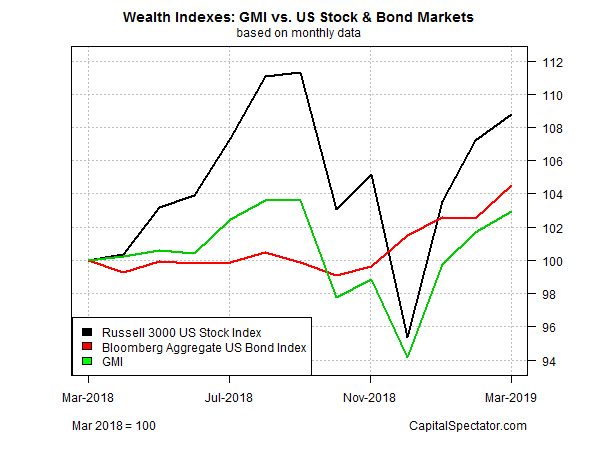 For the trailing 1-year period, US stocks and bonds (along with GMI) continue to post gains, courtesy of this year’s broad-based rebound in markets after the sharp correction in late 2018.